Only compatible with Siberian 4.13.10 and above. EMBED a website in the siberian Apps is not always easy. On Iphone also is not possible to manage the “return back” to previously page because is missing the “back” button. SCAN AN EAN or QR CODE and parse the result with a query string (GET) to a website to perform actions. 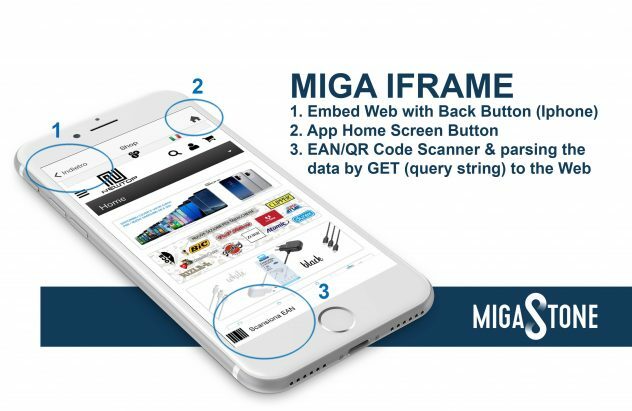 By selecting QR/EAN code scanner you are able to add in the Ifram a nice banner on the bottom of the screen where is possible to SCAN any QR and EAN code and parse the result in a query string URL (GET) to an external website. This solution is very nice and can be used for many integration, in our video tutorial we show for example an ECOMMERCE integrated with this feature that allows to search any product by simple scan the EAN code of the product. Another idea can be a wordpress website configured to search articles or pages by EAN code, by this way is possible to show informations, videos etc regarding any code scanned in the shop or other places. 2.0.2 Added “email” and “uid” parameter also to the iframe url. Added a spinner before the loading of the iframe page, to solve the problem of NET:Err_File_Not_Found on Android phones.